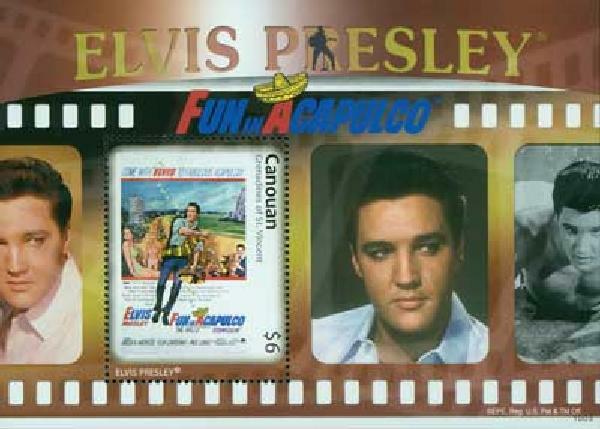 #M10612 – 2010 Canouan Elvis "Fun in Acapulco"
Fun in Acapulco was Elvis’ 13th movie, the 6th film produced by Hal Wallis, and the third consecutive movie set in a tropical paradise. This time, Elvis plays Mike Windren, a former circus trapeze acrobat who lost his brother – and partner – to a tragic fall. He tries to escape the memories in the Mexican resort of Acapulco working as a lifeguard. One of the more popular characters in the movie is 8-year-old Larry Domesin, who plays Raoul Almeido. Raoul is a shoeshine boy who acts as Mike’s manager, setting up singing jobs with his countless “cousins” located all over the city. Elvis fans will note how Raoul charges Mike a 50/50 split – just as Colonel Tom Parker would later charge in 1967 (a rate far more than other managers charged). It wouldn’t be an Elvis movie without beautiful women, and there are two stunners in Fun in Acapulco – Ursula Andress and Elsa Cárdenas. Swiss actress Andress first made a sensation as a “Bond Girl” in the 1962 James Bond film “Dr. No.” She plays Elvis’ main love interest, Marguerita Dauphin, the social director of the hotel where Mike works. Mike finds a rival for Marguerita’s affections in fellow-performer Moreno (played by Alejandro Rey), who performs a nightly stunt of diving off a 130-foot cliff into the surf below. After a fistfight between the two men, Moreno is too hurt to make the dive that night. Mike makes it for him, confronting his fear of heights and winning the hand of the lovely Marguerita.